The ‘Kerala backwaters’ resembles an avid tourist, nostalgia of house boats in Dal Lake in Kashmir, and Gondola ride in lagoon city of Venice. Backwaters in Kerala are elongated salty lakes along the Arabian Sea Coast (Malabar Coast) in state of Kerala in south India. The backwater lagoons are formed at the mouth of many rivers streaming into the Arabian Sea as a result of tides and waves of sea, shaping low barrier islands. Broadly, Kerala Backwaters is an extensive network of interrelated canals, lakes, rivers forming about 900 Km of waterways. Amidst these water bodies are situated numerous town and cities providing an ideal location and opportunity for Kerala backwater tours. These interconnected cities are commencing and concluding ends of backwater cruises. Among many lakes in backwaters of Kerala, Vembanad Kayal is the largest lake spreading about an expansion of 200 square kilometer. Kochi (Cochin) one of the prominent ports of India, is situated at the lake’s opening to the Arabian Sea. Alleppey also known as the Venice of the East, with its elaborate network of canals provides other ideal tourist destination on a Kerala backwater tour. The convergence of fresh water from rivers and saline sea water nurtures a distinct, though mesmerizing flora and fauna in the backwaters. 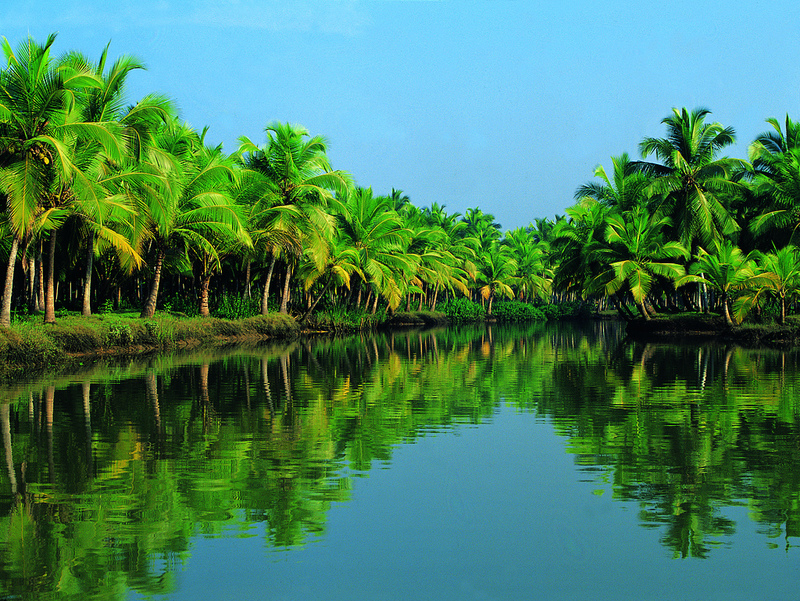 Variety in plants and trees like Palm trees, Pandanus shrubs and others can easily be seen at the stretch of Kerala backwaters. In marine life, its diversity consists of crabs, frogs, mudskippers and in birds kingfishers, darters and cormorants can easily be observed and are great treat for a birdwatcher. Kerala house boats also known as kettuvallams in local dialect (Malayalam) are one of major tourist attractions in the backwaters. According to estimation, around 2500 house boats stand on Kerala backwaters. According to amenities and charges, traveler can book houseboats in category of Platinum, Gold and Silver. In past, these house boasts were used as grain hoards to transport the rice grown in fields by the lagoons. They were also used as living quarters by kings and their families. At present, the houseboats are modified keeping in mind convenience and leisure of tourists with sleeping area, dinning space and deck to sit and peep around. Another attraction on a tour of Kerala Backwaters is snake boats or Chudan Vallams which participates in boat races held on the banks for recreation. A Snake Boat can be 100 feet long with an ascending hull extending to 10 feet. Each snake boat can have room for about 100 muscular boatmen. Majority of boat races are organized during Onam harvest festival in August. After learning this much interesting information about the backwaters, if you are planning to tour Kerala then you should tours the lagoon regions of Kollam, Alappuzha, Kuttanad, Kottayam, Munroe Island, Kasargod, Thiruvallam and Kozhikode within the periphery of Kerala Backwaters.